The program started in 2011 with the aim to classify all transients that are accessible from Asiago and are bright enough for our telescope/instrumentation. We use mainly the 1.82m Copernico telescope of Cima Ekar and, if not available, the 1.22m Galileo telescope of the Pennar station. A few cases of transients classified by our group with other facilities (eg. TNG) are included in the database. Transient classification information and spectra (fits format) are made immediately available at our site. The spectra are semi-automatic reduction with archive calibration data. Please keep this in mind when using them. For SN classification we compare the output of two automatic SN classification codes: Gelato (Harutyunyan et al. 2008, A&A 488, 383) and SNID (Blondin and Tonry 2007, Ap.J. 666, 1024). If you use some of the information posted in these pages please make a reference to the paper Tomasella etal. 2014, A.N. 335, 841. The Asiago Transient Classification Program (Tomasella et al. 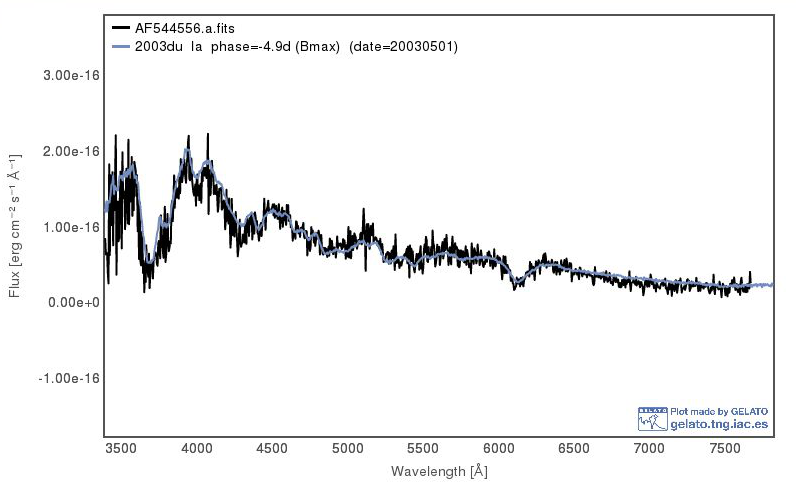 2014, AN, 335, 841) reports the spectroscopic observation of ASASSN-19hp, AT2019byw (ZTF19aamkywr) and AT2019cbc (ZTF19aamljom). The targets were supplied by the All Sky Automated Survey for SuperNovae (ASAS-SN, Shappee et al. 2014) and ZTF Survey (ATel #11266). The observations were performed with the Asiago 1.82m Copernico Telescope (+AFOSC; range 340-820 nm; resolution 1.4 nm). (1) The AFOSC noisy spectrum shows a blue (T about 17000 K) almost featureless continuum, typically seen in young core collapse SNe a few days after explosion. 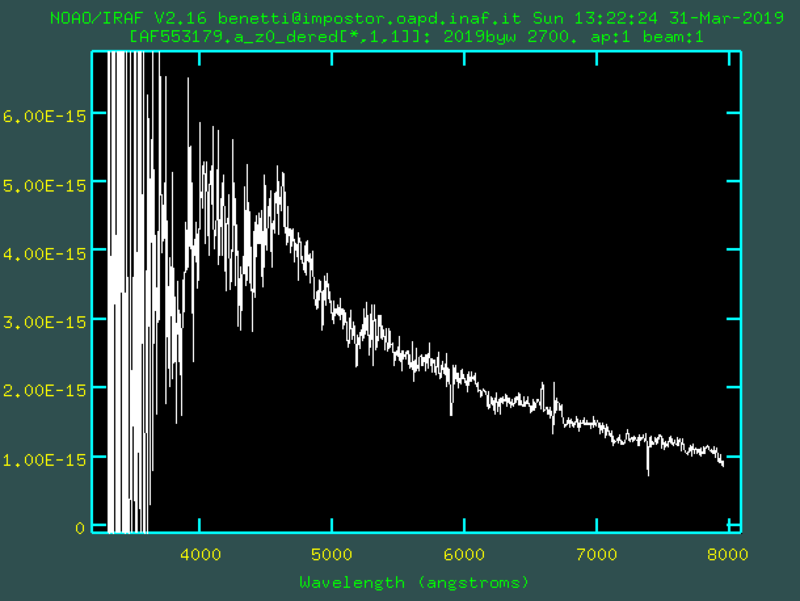 (2) The spectrum of this nuclear transient shows broad hydrogen and HeII lines superimposed to the host galaxy features. Considering both the the extinction in the Galaxy (A_V ~ 0.236 mag from Schlafly & Finkbeiner 2011) and in the host galaxy (A_V ~ 2.7 mag estimated from the interstellar NaID absorption) the corrected spectrum exhibits a blue continuum and the absolute magnitude is about ~ -20.6 mag (assuming a distance modulus of 35.64 mag, via NED). All this makes of AT2019byw a possible TDE event. 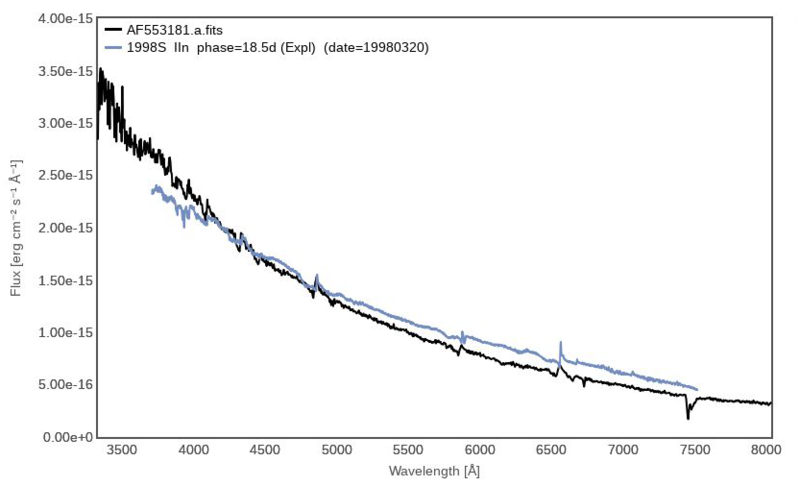 (3) The Spectrum is consistent with those of SN 1998S, about two/three weeks after explosion. and SNID (Blondin and Tonry 2007, ApJ, 666, 1024) tools.